What events/people or experiences led me to Komen Columbus? My mother was diagnosed with breast cancer at age 50 and we began doing the Columbus Race for the Cure with my family each year since. I started as a volunteer on the Education Committee after my mom passed away and did that for about 8 years until I was hired on as staff for the past three years. What do you do for Komen Columbus? How does your role help with Komen’s mission? I am the Volunteer Coordinator for Komen Columbus and help to recruit, train and place volunteers in appropriate positions. I coordinate our health fairs and educational events that take place through out the year and ensure that we have the right volunteers representing Komen. Our volunteers are the heart of what we do and we could not succeed without them. As a non-profit we rely heavily on almost 1,000 volunteers to put on a race our size. What (or whom) inspires you come to work every day? This is a three-fold answer with the most important being my mother whose life was cut so short (not to mention all the years I lost with her); and all the other survivors, co-survivors that continue to hope each day for a cure; both of my daughters that have two grandmothers that have had this disease – that they may never know its capabilities and lastly, the incredible staff I get to work with every day and the dedication and passion they have to our mission. I am so blessed to have the best job ever! 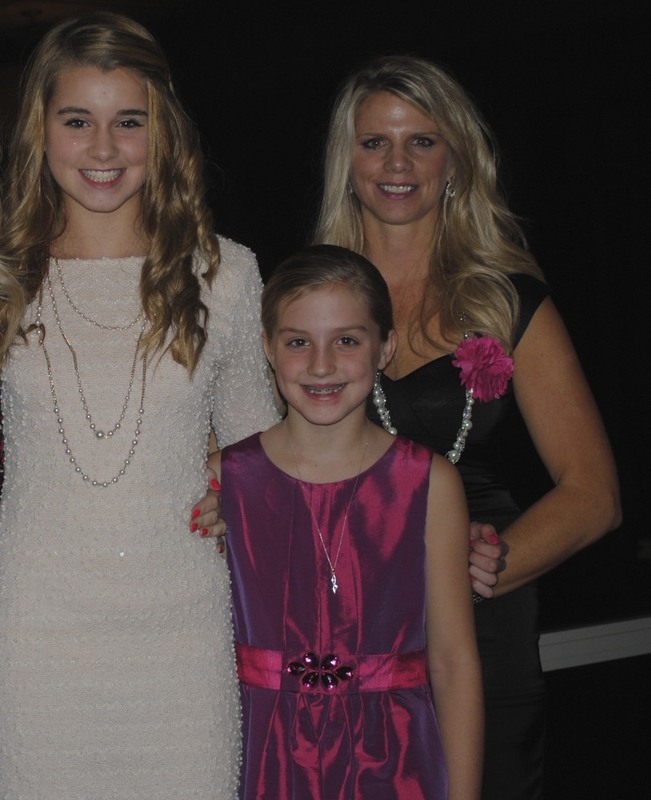 Natalie and her two daughters at this year’s House by House party she hosts in memory of her mom. What is the most memorable moment or event you’ve experienced with Komen Columbus? And why? The most memorable event I’ve experienced with Komen Columbus was the last race I did with my mom before she passed away. Our whole family was in tow, even the dog, showing our love and support for her and all the other women affected by this disease. My most inspiring event was the first Komen leadership convention I attended in Dallas, Texas. There was such energy and passion for what we do and I was so proud to be part of our organization. I enjoy spending time with my three kids and husband Michael. Going to lacrosse games, traveling to dance competitions. Spending many summer weekends at the lake camping and boating and sitting around the fire. Dinners with old friends and trying to squeeze in a book once in awhile. Always working on a redecorating project! What’s your favorite quote? Why does this quote “speak” to you? I feel that you don’t have to have a specialized degree or be an expert in a certain field to make a difference in someone’s life you just have to have compassion for others and a willingness to do something selfless. Sometimes the smallest gestures in life can mean the most! To meet other Komen Columbus staff members, click here. Learn more about Komen Columbus by visiting our website, Facebook and Twitter Pages.